Springs airfield (FASI) is a registered airfield which is leased from the local municipality and lies at 5340 feet MSL. It's has a runway 1100m long which is tarred. The orientation is 03/21. A grass cross runway exists on a 14/32 orientation. The airfield is uncontrolled and traffic in the vicinity uses the radio frequency 122,4 MHz for TIBA and circuit calls. Facilities at Springs include a fuel bay for AVGAS. The club shares a number of hangars and refreshments are available from local facilities. 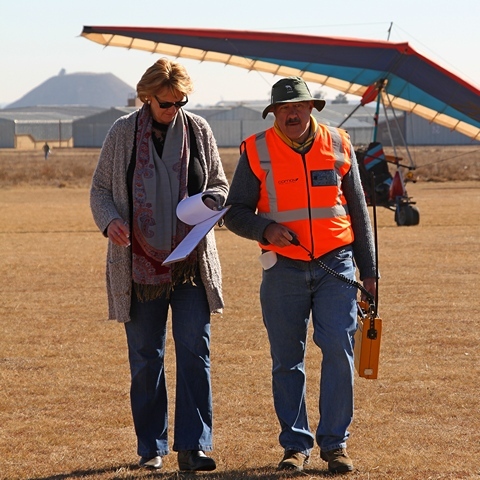 It is the home of the Springs Flying Club and the East Rand Gliding Centre and a number of operations including a micro-lite club, an ultra-lite club, autogyro club, EEA, flying schools and private operators. On the Saturday 1 August the Club again hosted their annual free fly-in breakfast and despite the biting cold 62 aircraft flew in. Recording all the arrivals and marshalling them to their parking spots were Paul and Mariette Sabatier who were ably assisted by Russell Dold. The arrival from Petit by a formation of two Allo IIs and two IIIs got the attention of all that were already on the ground and enjoying a scrumptious breakfast and steaming hot coffee prepared the by Raymond and his family were served in one of the hangers. Aircraft talk as was to be expected was the order of the day as old friends met and new friends were made. Most types were represented and it was especially good to see a large number of experimental types seldom seen at other fly-ins. Unfortunately the flight line quickly emptied as visitors some from as far as Witbank departed. The Springs fly-in's are also well attended and superbly organised and the hospitality out of this world.